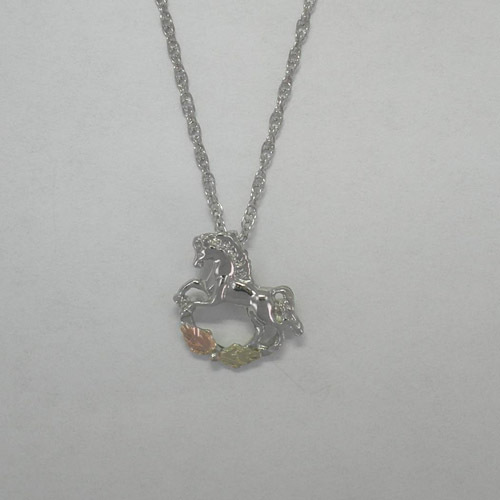 Desc: Black Hills Gold Sterling Silver small Rocking Horse necklace. The Sterling Silver chain is rope link and has a spring ring clasp. The small pendant is fashioned to resemble a small Rocking horse and has a hidden bale. 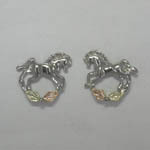 The horse is fashioned from Sterling Silver with rose and green gold leaves as the base. The necklace has a bright polish finish and is made in the United States of America. We have matching earrings, see SK1146.